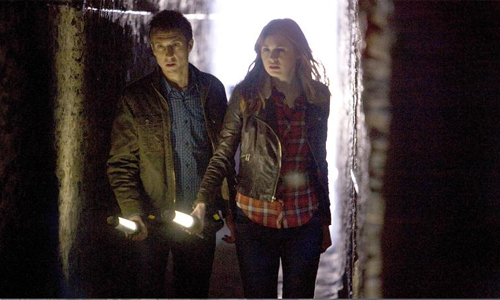 Cultural Wormhole: Doctor Who - "The Rebel Flesh"
Rory (Arthur Darvill) and Amy (Karen Gillan) go lurking through a dank, acid-leaking castle. Everyone likes to believe they’re one of a kind. Alas, in the words of Tyler Durden, “you are not a beautiful and unique snowflake”. There’s a lot of pathos and comedy to be mined from a doppleganger situation. In recent cinematic memory Duncan Jones explored the consequences of a man coming face to face with himself. 2009’s Moon was poignant, claustrophobic, blackly comic. Clones aren’t just a trope of sci-fi either; four hundred years ago, Shakespeare employed twins and disguises for his comedies of error. So I was looking forward to tonight’s first part of a two part story: The Rebel Flesh. The opening teaser boded well; fantastical but grounded setting (clearly a redressed National Trust property of somesuch), endearingly overambitious CGI, kooky industrial costumes. Best of all, a man melting into an acid pool while his colleagues looked on with nary a hint of hysteria. He was calmest of all; the victim of a childish workplace prank. In a theme that is becoming a little overplayed for my liking in more recent Who, death wasn’t the end. Still, so far so good-ish, though the lead into the opening titles was textbook anti-climax. And then the wheels came off. The story just died on the screen. After a promising setup the characters just were not developed, the drama left to peter out until I was looking at my watch, slouching on the sofa just waiting for something to happen. The irony was that in an episode about uniqueness, this was the most hackneyed hodgepodge of tired story elements yet; blue collar workers trapped in their workplace, being picked off one by one by a creature/lack of oxygen/religious zealot. See Alien, The Thing, The Abyss, Sunshine… bloody hell, even The Poseidon Adventure makes a decent hash of it, though in the latter examples it’s scruffy scientists and posh people respectively. The Doctor himself has been trapped in a similar scenario an average of once-a-season: Dalek, The Impossible Planet/The Satan Pit, 42, Midnight, The Waters Of Mars. All of these succeeded because there was a real threat, even if, in the case of Midnight, you never even saw it. In fact, the villain was so insidiously creepy in that Season Four stunner because it turned you against yourself. The biggest threat here was painful over-emoting during the obligatory existential whinge (‘I’m really a human being honest! I remember my kids and everything.’). Poor Arthur Darvill got left with the shoulder-to-cry-on duties, though at least this week he got to verbally address his propensity to die and be reborn like the ‘gangers themselves. That’s so meta. Yawn. The only real character here was Matt Smith’s Party Animals co-star Raquel Cassidy as foreman Miranda Cleaves (cool name) who had by far the best line (“You see that is just so typically me.”), though I’m finding the jokes thin and far between this season. It’s a scientific fact that laughs are inversely proportional to scares and the only other good one this week involved a northern accent. It’s only a matter of time before Peter Kay (Love and Monsters) makes a return. I’m at risk of turning into a right old man here, but as I addressed in my review of Day Of The Moon, Doctor Who is a difficult show to write. You need to please fans of the original run, those who have come to it since 2005 and even those who only dip in for the occasional one before going out for a few down the pub. The stories need to resist linearity but still not to the point they become so ‘timey-wimey’ we all give up and get the bus up town early. It’s a fine line to tread and this season has merrily skipped one side or the other without really finding a balance, except perhaps with The Doctor’s Wife. This one is definitely in the linear camp with a climax foreshadowed to the point that I was actually surprised the episode was ending. “That’s not really the end is it?” I asked incredulously, though with more than a sigh of relief. Perhaps writer Matthew Graham* and director Julian Simpson can reanimate this so-far lifeless story next week, but there’s only so many times my interest in this lacklustre season can be killed off and brought back to life… unlike Rory. *This guy wrote Fear Her. Worst. Episode. Ever. Be afraid, be very afraid of next week’s episode.